It can be difficult to know which health practices are effective and which ones aren’t worth your time. However, science has proven hot tubs provide several benefits to your health and are a prime way to recover after a workout. Having a soak in a hot tub, besides providing relaxation and pain relief, has been proven to aid in muscle recovery, reduced joint pain and sleep regulation. Watch the video to learn how Kate Nowlan uses her hot tub to recover after a tough workout. When you spend time in a hot tub, your body undergoes changes in blood circulation, metabolic rate, and core body temperature. 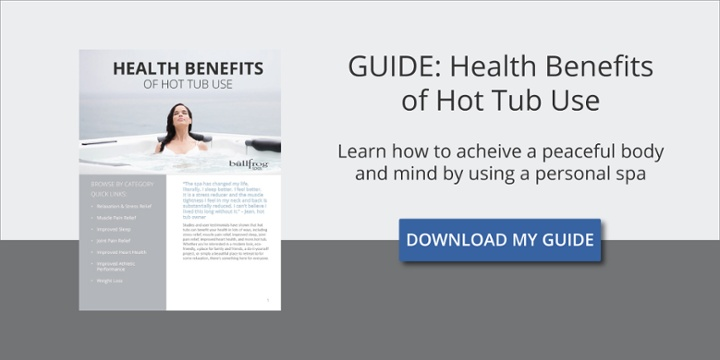 You might have asked yourself why so many gyms and recreation centers have hot tubs in their facilities. In addition, you may have wondered if a spa is good for you after a workout. Physical therapists often recommend hydrotherapy to reduce joint and muscle pain, and it can even be used to improve workout recovery. A study published in The Journal of Strength and Conditioning Research reports using a hot tub after a work out prevents elastic tissue damage. Myoglobin, a protein your muscles released into the bloodstream after muscle damage, had a lower presence in test subjects who used a spa after their workouts. Furthermore, a large factor in the effectiveness of a post-workout hot tub recovery is timing. After an enduring exercise, relaxing in a hot tub sounds perfect. However, to reduce muscle inflammation and get the most out of your experience, it’s better to wait until your muscles have cooled off and your heart rate has dropped back down to normal. Constricting blood flow to inflamed muscles with cold packs or cold water before using a hot tub has the best results. Use a cold pack or cold water for about 10 or 15 minutes, followed by 10 to 20 minutes in a hot tub. This practice can save you plenty of hardship and will reduce muscle soreness the day after you exercise. Working out without stretching first is a common cause for workout-related injuries. Runners and athletes who perform full-body workouts know their muscles and tendons need to be warm and relaxed if they want to avoid injury. Hot tubs dilate blood vessels to allow increased blood flow to your extremities and warm muscles to reduce tension. Therefore, a 10-minute soak in a hot tub combined with stretching is the perfect preparation for strenuous weightlifting and repetitive body motion. Don’t be surprised if you experience a wider range of motion after spending time in a hot tub. This is just another positive side effect of the heat and body massage provided by hot tubs. Have you ever noticed how your body tends to melt into whatever piece of furniture you rest in after using a hot tub? For the many people who have insomnia or irregular sleep, a hot tub could be the best thing to help prep for bed. A study published by the National Center for Biotechnology Information observed people who have insomnia sleep more deeply and soundly after a hot bath. This method cited in the study as “passive body heating” (PBH), is easily attained by use of a hot tub. It also has the added benefit of relaxing each muscle to avoid aches and pains which may pop up in the middle of the night. Building a routine of using a hot tub in the afternoon reinforces regular sleep cycles and deep, restful sleep. This improved sleep will, in turn, help your muscles recover faster so you can work out again sooner. An outdoor spa is a way to absorb nature and take in surroundings after a long day at work, after a workout, or anytime you need to recharge. Relaxing in a spa is important time spent on maintaining a healthy lifestyle. Relaxation and silent contemplation are necessities many people take for granted. Spas allow anyone to escape from the world for a little while, to clear your mind and let all the stress escape from your body. While in a hot tub, you’ll be provided with a relaxing place to read a book, let your mind drift freely without worry, or spend time with friends and family. Sometimes the greatest hot tub health benefit is taking time to forget about everything else and treat yourself to something nice.